A last minute shout out to all you budding fashion designers- the Vogue India Fashion Fund’s April 30th deadline is fast approaching so make sure you get your application in! 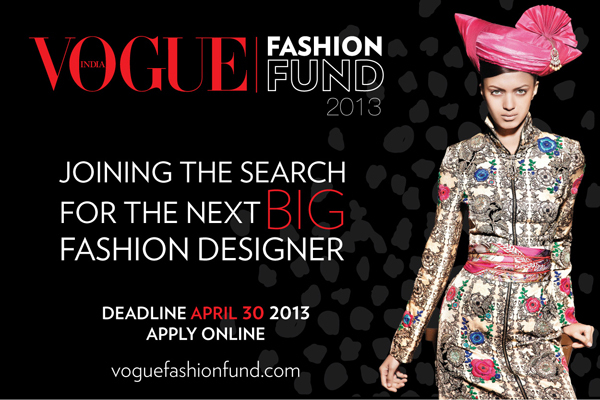 You can do that by visiting the Vogue Fashion Fund site and following the instructions. The Vogue Fashion Fund is a global initiative that has helped to shape the careers of some of the industry’s brightest talents. Past alumni include Joseph Altuzarra, Alexander Wang, Erdem, Proenza Schouler and of course Pero by Aneeth Arora- the first winner of the Vogue India Fashion Fund last year. Vogue India shot a short film last year explaining the Fashion Fund’s purpose and the behind the scenes process of how and who will be judging the finalists. and here’s what the winner of the Vogue Fashion Fund in colloboration with FDCI will win….